The Extra Yard for Teachers Summit is an annual experience designed to empower and inspire educators. Throughout this year’s interactive weekend in the Bay Area, thousands of teachers were welcomed by our CFP Foundation partners through a space filled with workshops, giveaways, and educational experiences. The Summit served as a space in the San Jose McEnery Convention Center for local and national teachers and their guests to relax, learn and win. 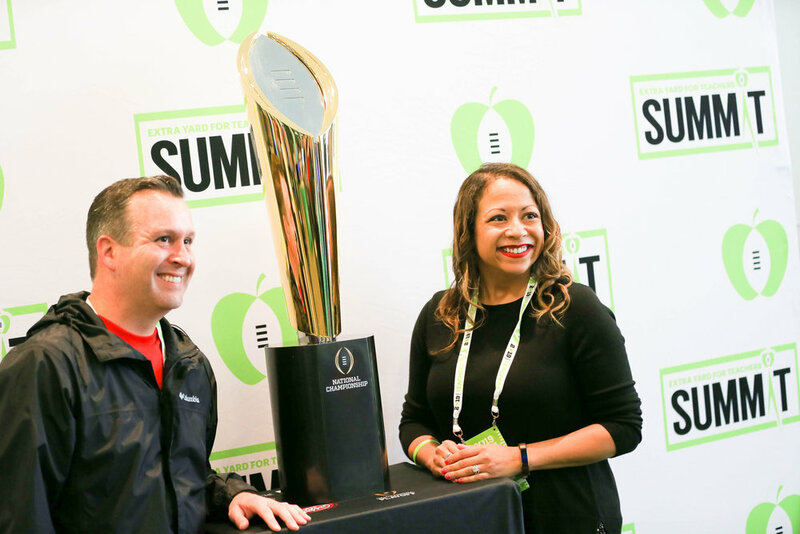 From continuing education workshops to celebrity appearances and giveaways, the Summit offered more than 50 activities for attendees. Prize drawings included two media room makeover giveaways sponsored by School Specialty, Inc., which were valued at $25,000 each. Several teachers won $500 DonorsChoose.org gift cards to cover classroom supply expenses, and Landed Homes surprised two teachers local to the Bay Area with a $25,000 down payment grant for a home.